Poking its nose in our direction to sample the sharp October breeze, a juvenile polar bear—one of the two dozen foraging on the pile of bowhead whale bones on a nearby spit—gingerly steps into the sea. It’s slowly heading our way, so Robert Thompson, a local hunter and guide who’s brought me to see the bears, puts his ATV in reverse, pulls back, and parks facing away from the bear, ready for a quick getaway if we need it. A stone’s throw is as close as I ever want to be, knowing polar bears can run down a horse at a short distance and kill a half-tonne walrus. With one hand vise-gripping the ATV’s rear rack, I aim my camera with the other, trying to keep it steady. The last time I saw a white bear, on a rafting trip in the nearby Arctic National Wildlife Refuge, it was four football fields away, snoozing, but my Remington was unsheathed and ready. For Thompson, a portly silver-haired Vietnam vet with eyebrows like bits of black felt, this polar bear encounter is routine business; the only thing ruffled is the wolf trim of his drab army parka. The bear, deciding we are not worth its while, returns to rummaging at the whale ruins. Akin to the wildlife presence in other Alaskan towns—moose roaming the backyards of Fairbanks and muskoxen prowling the runway in Nome—polar bears haunt the streets of Kaktovik, an Iñupiaq village of about 300 on Barter Island, set against the stark shores of Alaska’s Beaufort Sea. Alerted by barking dogs my first night at Thompson’s B & B, I looked out the bedroom window to see a plump ghost galloping down the main street, chased by the red truck of the community’s polar bear patrol, which orbits Kaktovik all night long, beginning at sunset. Here, the front doors of houses stay unlocked, allowing escape into an entryway if you are being chased, and it’s good practice to carry a can of bear repellent. The men and women of the bear patrol carry 12-gauge shotguns with beanbag rounds and cracker slugs for deterrence, and, in extreme cases when non-lethal means aren’t effective, they won’t hesitate to shoot an aggressive bear. In this sleepy hamlet, gunfire signals trespassing polar bears, not crime. But these interlopers also signal tourist dollars: as word spreads about the annual layover of these hard-to-see, popular mammals, polar bear viewing is fast becoming a cottage industry. But at what cost—for the bears and the community? In Kaktovik, as in the far better known Churchill, Manitoba, and elsewhere along the Arctic coast, polar bears become marooned on shore after the sea ice—their preferred platform for seal hunting—breaks up in the summer. They linger on shore in a state of “walking hibernation,” scrounging for food scraps and napping to conserve energy, waiting for freeze-up when the cold once again puts a lid on the vast Arctic Ocean. The area around Kaktovik hosts growing numbers of bears each summer, and, as the Arctic remains ice-free longer and even the winter ice thins, these ursine guests are lengthening their stay. In 2015, for instance, the sea ice near Kaktovik was gone by July, one month earlier than normal and the earliest ever according to one seasoned Iñupiaq hunter. This, however, was only a portent for 2017, when global sea ice reached a record low. It’s not surprising then that the lack of ice and a shortened hunting season has affected polar bear populations. Numbers of the southern Beaufort subpopulation, which includes the Kaktovik bears, have dropped substantially, to 900 animals, in the past three decades. (The exact peak number is hard to determine, but is thought to have been as high as 1,200.) According to the US Fish and Wildlife Service (USFWS), in this, the most-studied polar bear population beside Churchill’s—one of 19 that inhabit the Arctic—fewer cubs now survive. Over the years, the agency’s biologists also have noted that the bears’ size has diminished. Polar bears are used to at least a partial fast during their summer months on land, but for the bears near Kaktovik, survival rations can be found close to town, at the bone pile near the airport hangar—the remains of bowhead whales that locals butcher on shore. Three whales have been taken this fall—the community’s allotted annual quota—keeping families fed. The remains mark the spit like carcasses of some extinct race of giants. Scraps of spoiled blubber and muktuk (whale skin) from people’s freezers on occasion augment this cetacean buffet. An ATV puttering out to the bone pile loaded with such bounty is like a dinner bell ringing. From miles away, bears resting on the barrier islands catch a whiff of the rank deposit and swim or walk to the smorgasbord, where dozens might congregate at one time. There they’ll feast, peaceably as a rule, now spending more time on land and sometimes mingling with grizzlies as the climate changes. Up to 80 furry gourmands can be seen near town during this ursine rush hour. Even when they don’t drift through people’s backyards or curl up under houses built on stilts, white bear proxies are everywhere in Kaktovik: spray-painted on a rusty, storm-blasted dumpster; emblazoning a sign welcoming you to Beautiful Barter Island; as logos on van doors and sleds and the defunct B & B, Dance With Polar Bear [sic]. Their pigeon-toed tracks stitch the muddy roads, evidence of bear agendas, bear appetites. Overall, this Arctic community has learned remarkably well how to coexist with stranded megafauna and benefit from them. In the past six years, small ecotourism businesses like Thompson’s have sprung up, cashing in on the white bear bonanza. Between 2010 and 2016, the number of USFWS-issued permits for commercial polar bear viewing on waters managed by the Arctic National Wildlife Refuge rose from one to nineteen. During the same period, the number of people bear watching snowballed from about 50 to roughly 2,500 a year. (Refuge staff does not track visits to the bone pile by van or by truck, as that land belongs to the Kaktovik Iñupiat Corporation.) They fly into Kaktovik on twin-prop planes, armed with lenses as long as my forearm, lured by the package of whaling culture, auroras, and views of the Brooks Range blue in the distance—but foremost by the thrill of meeting Earth’s largest land predator in its home environment. And therein lies a dilemma. Many visitors are hobby photographers who crave the trophy shot to validate the experience and justify the expense—even without the round trip to Fairbanks, a three-day polar bear viewing excursion can set you back thousands of dollars. In the bid for satisfied customers, rules and ethics the USFWS has been trying to implement are easily compromised. Bears have been fed from the back of tour boats to attract them, and the prescribed distance of 30 yeards (27 meters) that keeps bears from getting stressed and tourists from getting injured or even killed has been breached repeatedly. There is strong pressure from tourists to get closer, and reportedly a few have forsaken boat captains who refuse to do this, traveling instead with those who will. Any interaction with the bears, such as harassment or attempting to draw their attention, is discouraged to keep them from getting habituated. Still, some people ask their guide to make a bear stand up, hoping for that prize-winning photo. The guides, if caught in any violations, risk losing their license and cabin boats with powerful motors, an investment of US $60,000 or more. In the ramshackle Waldo Arms, some French tourists fuel up on greasy burgers, while others, bent over laptops, edit their polar bear images. Fringed bowhead baleen with scrimshaw designs lies on the pool table, enticing souvenir hunters to leave a few more dollars in the community. DO NOT FEAR THE WIND, shouts graffiti on the message board beneath the felt-tip pen cartoon of a bear. When lunch is done, an old school bus conveys visitors to the boat launch for their afternoon tour. Others pile into the back of a pickup truck, dressed like members of Robert Scott’s doomed Antarctic expedition. In their fancy goggles, balaclavas, Gore-Tex pants, and red Canada Goose Arctic Program parkas or cold-water immersion survival suits, these polar bear pilgrims stick out in Kaktovik, where the dress code is decidedly working class. Tourists here expect a more personal experience than in Churchill, where crowds are trucked in on Polar Rovers (deluxe Humvees on steroids that can hold 50 passengers) and the mobile Great White Bear Tundra Lodge, a fat-tired train of hotel rooms, parks right on the fasting bears’ turf. Dinner smells from the lodge windows magnetize the bears, which, tourists complain, come begging for food rather than exhibit wild behavior. From elevated viewing platforms, the bears are also never encountered at ground level, a drawback for many photographers; the boat decks in Kaktovik bring them face to face. 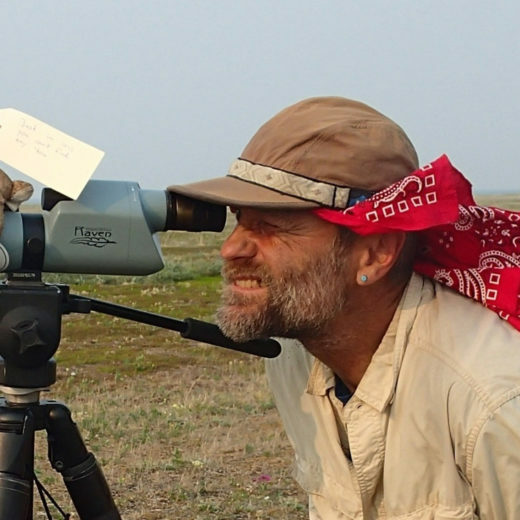 Among photographers who visit Kaktovik, an unofficial ranking as arcane as the Boone and Crockett Club trophy hunting register (which scores animal attributes such as fur color and antler or horn size) rules the blazing cameras competition. Bears grimy from foraging in the bone pile or rolling in the dirt are undesirable, but smeared with blood, they become interesting, living up to their “killer” image. Cubs playing, males fighting, bears swimming, or mother-and-cub motifs are also highly coveted, as are photos with a bear mirrored in the still waters of the lagoon or gazing directly into the camera. “I got my $7,000 worth right there,” one photographer tells me at Thompson’s B & B, recalling her capture of a mother and cream-white cub in the slanting afternoon sun. Return visitors crave a particular image or get hooked on adrenaline’s rush. A few, such as Shayne “Churchill is so passé” McGuire from California, then become tour guides who finance their passion by bringing like-minded seekers to Kaktovik. “I don’t like to see animals harassed,” McGuire says in a voice thick with emotion, recalling Churchill bears being pestered by flightseeing helicopters. But out on the lagoon, even here in Kaktovik, one can see bears corralled by three or four tour boats. Not all residents embrace the opportunities ecotourism brings. There is concern that pictures of butchered whales, bearskins, or skulls—a normal part of the landscape here—could provoke animal rights groups and environmentalists. Occasionally, locals who need to go to Fairbanks or Anchorage for medical treatment have been unable to get seats on fully booked planes. Tired of the recreational takeover, one old-timer, according to Thompson, angrily tried to chase off bears while tourists were watching, and almost got killed when his ATV did not start up again right away. Envy of those few who are lucky or savvy enough to tap this newfound wealth can also sour the atmosphere in a community where members have always depended on each other; for millennia, they’ve survived by sharing and cooperating. To counter the negative effects of tourism on the locals—bears and people—the USFWS, in concert with the school, mentors Kaktovik’s youth ambassadors, who greet incoming visitors and try to educate them about Iñupiaq culture and bear viewing etiquette. Perceptive visitors quickly realize that this paradise comes with pitfalls and thorns. Perhaps the community will balance the presence of tourists and bears in the future, but today they face a different balancing act: the environment that has supported both indigenous people and polar bears for thousands of years is shifting below their feet. As changing pack ice shortens the polar bears’ hunting season, shrinking shore-fast ice inhibits the ability of Iñupiaq hunters to intercept migrating whales. And sea level rises and coastal erosion—worsened by storm-agitated surf—puts low-lying Arctic communities at risk of flooding, and means bears lose their den sites. Humans stand out as one of the most successful species on Earth, in part because of our adaptability—all Iñupiat are a testament to that. But the highly specialized bears are not so blessed. Locked into more fixed behaviors and bound to evolution’s slow clock, the chances that they’ll weather the changes to their place of origin are slim. Their loss will be ours as well. Cite this Article: Michael Engelhard “The Bounty of the Bone Pile,” Hakai Magazine, Feb 27, 2017, accessed April 26th, 2019, https://www.hakaimagazine.com/features/bounty-bone-pile/.